This postcard is for sale on eBay but I'm wondering if it has been misnamed. Is it of Station Road, in Hayes, Middlesex or Hayes, Kent? 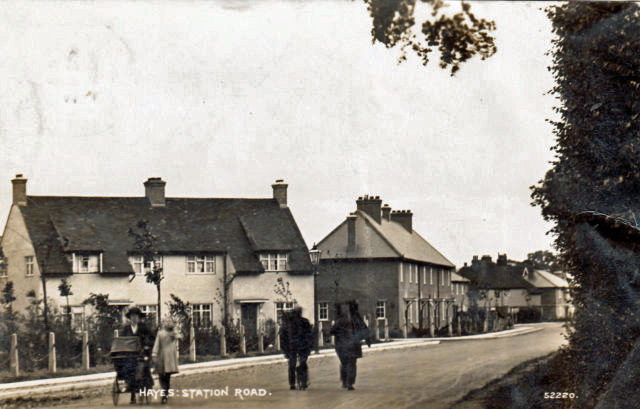 If it is Hayes, Middx perhaps the location could be identified by a local historian. That looks like Coldharbour Lane down near Orchard Road or Eastholme. I checked today. That is ineed Coldharbour Lane at junction with Eastholme. Many thanks for checking, Josh. When I saw the pic I too thought it was of East Holme but when I checked Google StreetView [ link ] the houses appeared to be entirely different--the present buildings on East Holme have an arch that goes from the front to the back--so they must all be replacement houses. I was wondering about it because of the location saying 'Station Road'. I was thinking it was possibly in the East Avenue area. About what year would the picture have been taken? Marian, the eBay listing, now a 'Completed Listing' listed as "HAYES STATION RAOD (sic) LONDON/MIDDLESEX (V68)" said that the postmark was "Hayes 1923". Oh drat, I'm wrong aren't I. I drove past and noticed several definite similarities, but looking now on Streetview, I can see there are major differences which mean it can't be East Holme. I looked on eBay and couldn't find the card. Do you have a link? Chris/Josh;-I saw this card and saved a copy, been puzzling me ever since, IF it is Coldharbour Lane, which I think not, then it's captioned wrong. The houses on the left are identical to the block in East Way opposite where the Standard used to be, BUT the rest of the houses just don't fit in. They are typical of the 'Townfield Estate' houses, if indeed it is Hayes Kent, then perhaps they were built by the same firm, bit of a coincidence though. A puzzle. But I now believe that the postcard IS of Coldharbour Lane and East Way. The difference between the postcard and StreetView can be explained by the sometime removal of the white building on the left of the postcard, leaving only its twin (to the left as you face the houses). In fact, when you look at this StreeView perspective on East Way you may see what could appear as building foundations of a removed building. Barry, please take a second look. [ link ] I believe you can see the foundation of a removed building. This post (and my earlier one) has been edited--thanks Josh, my monitor was not showing the far right screen image and the 'edit' button. This really IS a puzzle isn't it!!! There is not a shadow of doubt in my mind that these are houses on the Townfield Estate in Hayes, almost certainly Coldhabour Lane. Looking at your Streetview link Chris, I'm not sure the missing house would have room to fit in the gap? I must also check dad's very old map of Hayes, which used to be in these albums, whether perhaps Coldhabour Lane was once called Station Road. Another puzzle is the bidding war for the card on eBay and the high price it stood at last time I looked. Can that be real? I am probably totally wrong but a plane crashed after departing from Northolt in 1946 and crashed into some houses. I wondered if the houses are those which would have been damaged. Just a thought really. It is still a puzzle about Station Road though. Marian. I'm sorry, everyone, but I was wrong! That plane was a Dakota which crashed into a roof of a house in S.Ruislip and not Hayes. The picture certainly was a puzzle and yet those houses were not very far from where I once lived. Trying to identify them led me to discovering what Station Approach looked like in Hayes in Kent and some of the history of that area too. Well done Sherlock (Josh), the top of my road, and still couldn't see it, makes me feel a right twit. Thanks :-) Looks like the junction there was altered after the old picture was taken. I don't suppose you knew Sylvia Hunt did you who lived in the right end house? Thanks for the link to the library pic ChrisB... I think we'll have that in our albums!